I'm a vegan Registered Dietitian, endurance athlete and activist living car-free in California. I think fun, adventure, and healthy eating go hand in hand. Portland and Scotland Vegfests Coming Up! I have a very exciting couple of weeks with talks at the Portland Vegfest this Fri, Sat and Sun (yes, 3 talks!) and then I travel across the pond to visit Glasgow and the Scotland Vegfest. I’ll be speaking there Sat and Sun, December 5th and 6th. Any recommendations in either of those cities? Do you plan on going? Be sure to say hi! While I’m traveling be sure to follow me on Instagram, Twitter and Facebook for updates and more. Comments Off on Portland and Scotland Vegfests Coming Up! I’ve updated my events page with some fantastic stuff coming up before the end of the year, including Vegfest Scotland! All of the info is below. Did you see my short article and recipe in Bicycling Magazine? 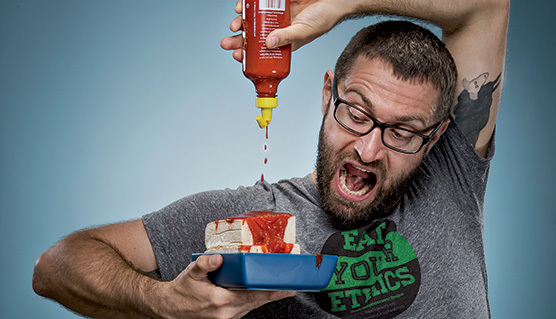 Sure was cool of them to talk with me about tofu and include such a fun photo. My site isn’t updated as often as I’d like so be sure to follow me on Instagram, Twitter and Facebook for articles, updates and more. Hope to see some friends at the Silver State 508, happening this weekend!